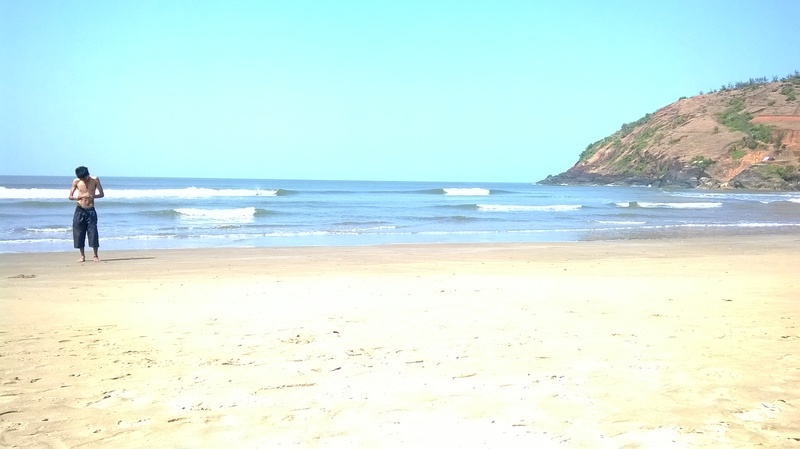 Gokarna – Where the Sea meets the Sky! Trippy Hippy at Kudle Beach! On a sultry Friday morning, my friend and I sat on the balcony of his penthouse apartment in Central Bangalore, listening to music and making idle conversation about our various trips to other places and dimensions. At one point, I told him that I’d always heard of, but never been to, Gokarna, which was apparently exactly what Goa used to be like, years before the festivals and tourists started pouring in and diluting the local scene, which was one of actual peace and serenity. My friend went on then, to describe to me a Paradise on earth, talked about the beautiful, pristine beaches, devoid of the clutter produced by the nonecologically-minded crowd one so often sees in popular vacationing places, and the rural flavor of a coastal country beach resort. Sitting around, realising that I had a couple of days to kill before I was scheduled to hit Goa in time for the upcoming Dreambubble 2.0 festival at Westend, Saligao on the 22nd, I suggested that he get off his rear end, and pack a couple of t-shirts, shorts and a pair of trunks, because we had a bus to catch. I wasn’t going to waste any more time than was necessary, soaking up the city sun. I’d rather be sipping a drink at a beach shack looking out over the Arabian Sea, watching the tide go back. I booked tickets for us online at Redbus.in, which cost us around Rs. 500 per head. We boarded the multi axle Volvo at the central bus point, Majestic in Bangalore city, and after a ten hour haul, with a short break in between for tea and one for dinner, reached the pleasant coastal heaven of Gokarna, in North Karnataka. This sleepy little beach town has the look and the feel of a place unhindered by the whirlwind progress of modern society and technology. This is a place, unaware of the concept of time and routine. Everything in the town lends to the laid-back, rustic air. One gets off the bus, and comes face to face with warm, smiling visages, tanned ripe in the sun – friendly locals and foreign nationals who managed to get similarly drawn into the timeless state of being that is Gokarna. The roads about this place are dusty and narrow, and one takes an autorickshaw up and down the rocky, hilly paths that lead to the coastline, dotted with small, peaceful beaches formed in beautiful natural bays. My friend and I had already decided on Kudle beach, as this was the quietest beach, and mostly frequented by hippies and yogics and seekers of peace and serenity. My first glimpse of Kudle beach was after a long, wiring bus ride, weary from the heat and with the load of my fifteen kilo haversack that had everything I needed till I reached Goa. On seeing the view of the horizon, stretched like an infinite turquoise line, much like a long shot from a wide-angle lens, in union with the sky, that stretched limitlessly above, into the wild blue yonder, my weariness dissipated! I dropped my sack, and leaving it and my bewildered friend standing at the north end of the beach, I took a morning jog down to the other side of the beach, all along the bay, following the beach rule – walk along the sea side, not by the land rise. Always have followed this, as it prevents me from accidentally bumping into someone engaged in something or absorbed in their own, private states of mind, further inland on the beach. It’s a good ethic in general, and anyway, you’d want to look out to the sea, that’s what you’re there for at the beach! I returned to where my friend had selected a beach shack for us to stay the night, one that he’d vehemently recommended from a previous visit to ‘Goks’ as he was wont to call it, after his usual habit of word corruption (private joke, that! ), the aptly named Sunset Café, a delicate construction of bamboo and wood, serving Continental and Italian cuisine along with the local seafood and coastal fare. We checked our hut out, a small thatched shack, reminiscent of places visited in the olden days, with musty sea smells and creaky doors and windows. It emanated a air of peace, that guaranteed a warm security and a chilled-out, beach feel. I lit my sky blue, ocean-scented candle (sic). Breakfast was the frosty nutella pancakes I love to sample on any vacation, as it gives me a general idea of what the fare is going to be like, based on the consistency of the pancake and the skill in lathering the warm, dripping nutella or maple syrup. Sunset Café wins on both counts. We sat at the breakfast table, facing the beach, and called for one of the hawkers who was wreathed in multi-coloured sea shells and chains, and haggled over the prices for some cool green stone necklaces and bands made of elephant hair (which is fireproof, as the man very confidently demonstrated with my lighter). As soon as this vendor left, up came the man who sold drums for a living. After some energetic thumping on a Djembe and hand held Congo, accompanied by my friend’s beatboxing, putting up quite a show for people on the beach and the other breakfasters in the shack, we bought the latter after our jaws dropped, hearing the price of the former. We gathered that the local hawkers here are ready to make all concessions to make any kind of sale, as the tourist influx has dropped of late; what with several of the shacks at Paradise Beach shutting down, the local economy has taken a turn for the worse. This also translates into Gokarna being a much less-crowded, more peaceful spot, where a lot of people are actually here for the serious business of relaxation and focusing their energy flows through Tai Chi, Suryanamaskar and Yoga on the beach. There’s even free classes early every morning. Up until this point, I’d been resisting the call of the sea, heavenly as it looked, with the cool blue water and the low sun at 9 in the morning, but now that we’d rested a while, I changed into my trusty Speedos and took to the water like the proverbial fish. My friend stood there on the beach grinning, wearing hippie blue shades, while I splashed about in the water, standing in the shallow bay, with waist-deep water up to 300 feet into the sea. I found a starfish, drying in the warm sun on the beach after my swim, and picked it up to take home as a souvenir of this trip. Now, we decided to go to the more popular Om beach, further south down the coast. We took an autorickshaw and reached the beautiful coastline which is figuratively shaped, as the sacred syllable of the Hindus. At the very apex of the middle prong of the Om, there is a rock that juts out into the sea, atop which sits perched a (supposedly) naturally formed Shiva Linga as a symbol of might, placed solitary against the endless sea. We’d had enough of the blasted autos, and therefore thought it would be worth the trip to hire one of the local, motor-powered fishing boats back to the sanctity of Kudle bay. The boat ride was a lovely experience, with the vessel almost capsizing when I over-enthusiastically tried to shoot a dolphin playing in the waves (I failed!). Back at Kudle beach, which we alighted upon like bosses, we met a group who’d been travelling on the same bus, from our city, and I borrowed a guitar that one of them was carrying (though not playing). I’d been sorely missing my own Clayton by now, so I was happy to have six strings under my fingers and a warm, setting sun above my head. We headed down to the beach after a coffee shake with ice cream, and sat on the sand, playing old tunes by the Beatles and smiling back at the amblers-by. And what I have managed to take away from that amazing conversation has been Vid, as the old Canadian hippie called himself, lustily singing an obscure number he’d heard at the legendary festival, something by Janis Joplin that has been lost to the passing notes of musical history. We’d had a beautiful day at the beach, and we wanted to end it in a similar vibe of peace and good fun. We built a bonfire from the many rushes and pieces of driftwood lying around, and stocking up on soda, spent a considerable part of the night sitting out under the stars, talking to people who came to share the warmth of our fire and the low-bpm progressive psytrance we played. And the next morning, we caught a local bus to Goa! And hey, way more pictures soon! I promise! I have amazing ones, really! Bandhavgarh tiger reserve Madhya Pradesh.